The first half of the 1940’s turned out to be the period for Richard Uutmaa when he developed and found his style since the works he completed in the 1940’s are his best works. He participated a great deal in exhibitions during the war and also attracted the widespread attention of critics. His subjects were mostly themes associated with life along the seashore. He has repeatedly depicted the patching, twining, and mending of nets, and other such work. The latter half of the 1940’s was contradictory for Richard Uutmaa and his creative work. It is known that he planned to flee from Estonia in 1944 yet he nevertheless remained in Estonia with his wife because she pleaded with him to stay in Estonia. Instead, after working in Altja as a freelancer for several years, he went to Tallinn, where he was a lecturer at the state institute for applied art. 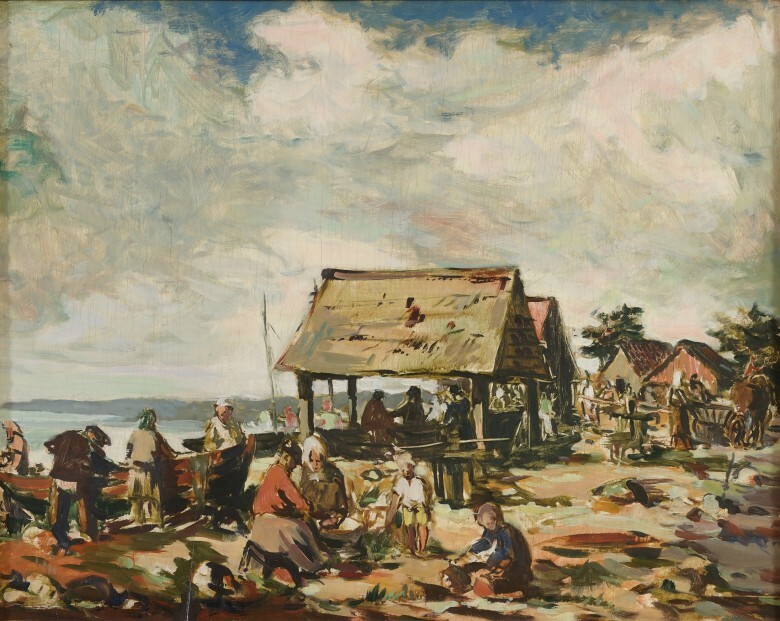 Uutmaa brought three paintings to the 1941 spring exhibition: Rye Harvesters, Sheep Shearers and Fishing Net Repairers. These are three large figural compositions which form a complete set in terms of their dimensions, theme and approach. According to researchers, this trio with its pastoral story line was in the context of the events of those times (the Second World War and occupation) a homage of a kind to Estonian life. 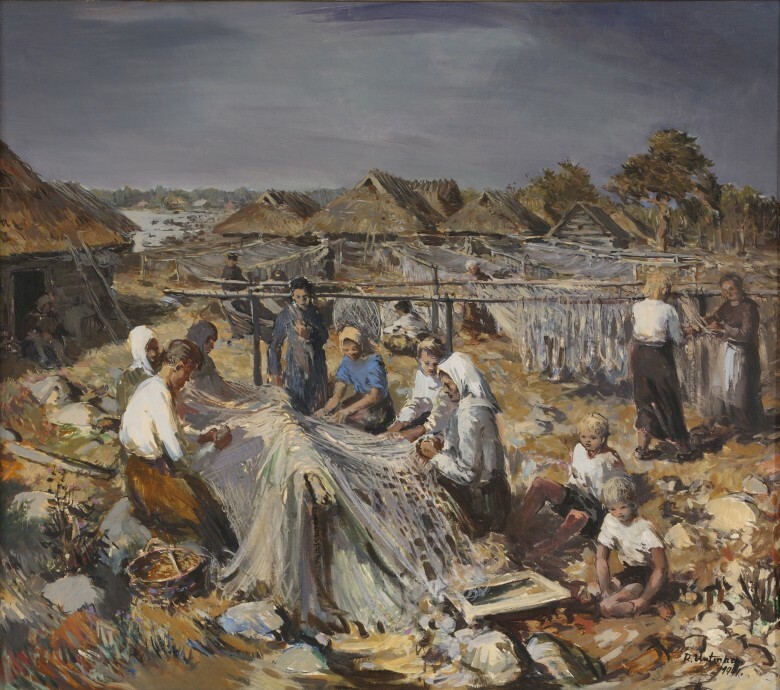 Rye Harvesters is probably his best known painting of the trio since the second is missing to this day and the third – Fishing Net Repairers – has only recently been reintroduced to the public. Since Uutmaa lived in his home village of Altja at the time that this painting was completed, it can be presumed that this work was also at least partially completed there. Even more so – Uutmaa also depicts himself here: the only man in the painting is the artist himself. It is a good idea to consider the symbolism of colour in the case of this work. Namely, he has painted the blue-black-white combination in the heart of the picture where the shirt of the artist himself is white. The same kind of combination can also be seen in Rye Harvesters. Richard Uutmaa was from a family of seamen on the northern coast but he painted Southern Estonia often in his creative work. 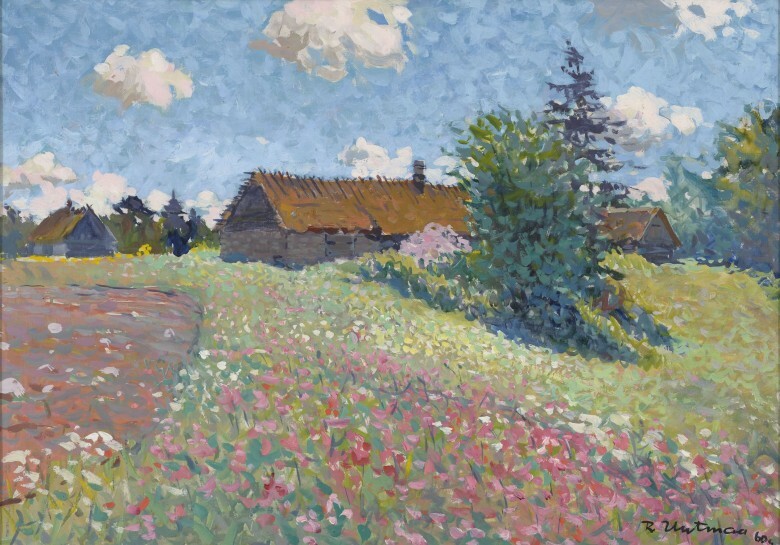 Even though Uutmaa also established his later life in Tallinn and his summer cottage was in Northern Estonia, he often went on painting excursions throughout the entire republic of his native Estonia. This work, however, is one of Uutmaa’s earliest Southern Estonian landscapes. 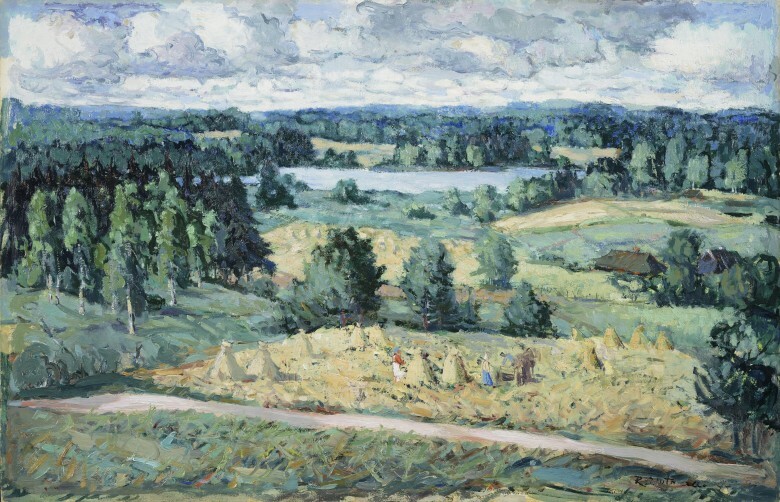 Uutmaa developed closer contact with this region in the 1930’s in particular when he studied at the Pallas Art School and when painting Southern Estonia was a popular theme among artists. This work created during the Second World War belongs to Uutmaa’s finest period since his creative work was of considerably more inconsistent quality in the post-war period. This work was also probably completed at Altja, even though Uutmaa also stayed at Vääna often during this period. 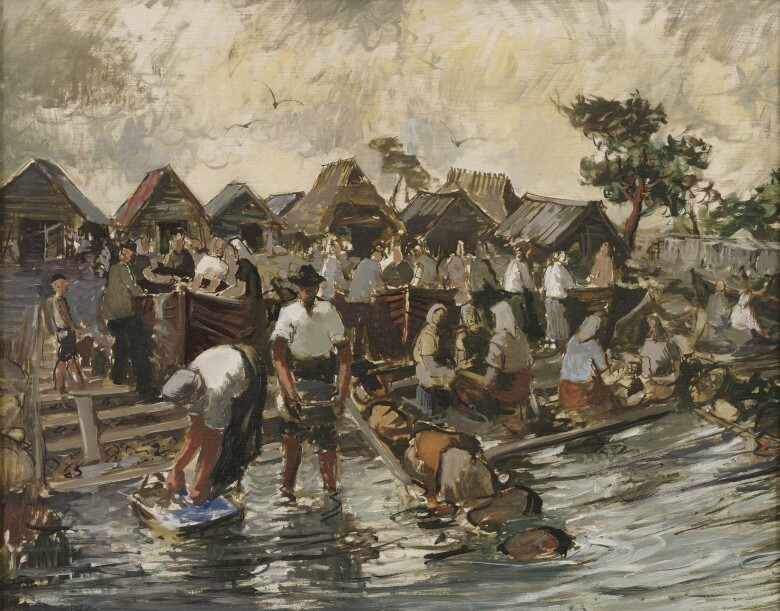 He continues with a familiar theme though the times had nevertheless changed so much already that the idyllic coastal life depicted started gradually acquiring the undertone of referring to the “former era”. Richard Uutmaa’s childhood home was in Altja, where he often went to paint in the 1930’s and the first half of the 1940’s. But his home farm was destroyed in the war and afterwards Uutmaa looked for places where he could paint. Uutmaa undertook several trips by motorcycle or car throughout Estonia. It is known that in 1960, he spent time in the Rõuge area in Southern Estonia as well as in Saaremaa and on Muhu Island. The scene in this painting is also from somewhere in one of those areas.